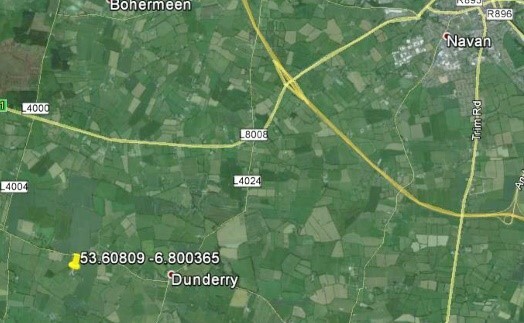 Today there are no remains visible overground- off the M3, south of Navan, on the L4024 and west of Dunerry. When the friary in Trim came near to closing about 1700, the friars became involved in parish work in an area north of the town and also in an area around Navan. From an official residence at Courtown. They served the parishes of Bective, Clonmaduff, Courtown, Kilcooley, Moymet, Rataine and Tullaghenoge. They also worked for some time in the parishes of Donaghmore, Donaghpatrick, Kilberry and Loghan. In 1801 there was a community of three at Courtown, and a parish priest plus six curates working in the area — a total of ten. Courtown officially closed following the death of Fr Patrick Ryan in 1826.